I am just about to start work on some exciting new sculpture projects. As ever with large scale public art works, they take time to design and also to go through planning. Hopefully they will be worth the wait. The next piece that I will be working on is a Woodkirk sandstone sculpture that will be located on the Saltbrook Trail. This walking route circles the Nestle factory at Hatton in Derbyshire and sculpture will depict something from the 100 year history of the company. 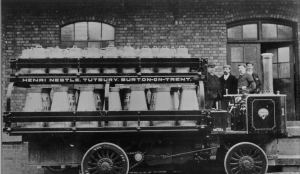 There has always been a close relationship with Nestle and the South Derbyshire town. Even from its early days, the factory has relied on local farmers delivering fresh milk to the site for decades and has rewarded the community with large scale secure employment in exchange. The Saltbrook heritage trail not only celebrates the relationship of the town with Nestle but also with a number of other industries that have served the town and other artists will be looking to create sculptures that represent those. I will be involved in some community workshops at the site of the sculpture on June 16th, please feel free to drop by if you are anywhere near. Another one bubbling away is a project to create a series of sculptures as part of the Heathlands Reunited project in the South Downs. I have been visiting 7 sites near Midhurst in Surrey with a view to creating a sculpture that captures something unique about each location. I will be using information gathered by local volunteers through oral histories as part of the research while I have also been on walks with some of the rangers to discover some of the unusual features of the reclaimed heathland sites. There will be community workshops in the coming months that may also go some way to defining the nature of each piece. With other sculpture projects in Leicestershire and Wakefield also at the final stages of design, the remainder of 2018 promises to be a very busy time.